Browse the interactive version above, download here as a pdf, or purchase print copies at the online store. When I was a seminarian back in 1980 we were less than six years distant from the synodical upheavals that came to a head in 1974. One of the documents that every seminarian was required to read in those days was the 1970 report of the LCMS Commission of Theology and Church Relations (CTCR) entitled, Gospel & Scripture. Prof. Harry Huth of Concordia Theological Seminary, Fort Wayne, who served as the primary drafter for the report, penned what is arguably one of the most important reports ever put out by the CTCR. Or at the very least, it was a very formative for an entire generation of seminarians like myself. That report formed in us a distinctively Lutheran way of approaching the relationships between the Gospel and the Scriptures by identifying two boundaries to avoid within our culture. On the one hand, it distinguished Gospel centrality from Gospel reductionism (Gospel as norm in Scripture versus norm of Scripture) as had all too often happened in more liberal theologies on the left as a way to dismiss difficult passages of Scripture. On the other hand, it distinguished a Lutheran approach to the Bible from fundamentalist approaches on the right that was often modernist and rationalistic. That is to say, “Our view of the Bible is a result of our faith in the Gospel; our faith in the Gospel is not a result of our view of the Bible” (Gospel & Scripture, 15). The issues it dealt with nearly fifty years ago remain in various forms today. And so here Dr. Timothy Saleska picks up the theses and central points made in Gospel & Scripture and applies them to our context today to keep us from veering into the ditch on either side of the road. Concordia Pages is a series of shorter articles and essays available as PDFs for individual study or small group discussions in congregations, Bible studies, or among church workers (such as the Winkel conferences in LCMS circles). The PDFs are available electronically for free at ConcordiaTheology.org. 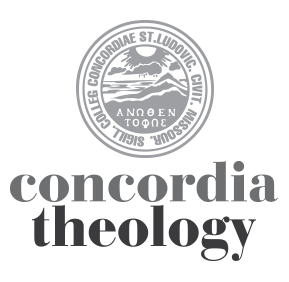 Professionally printed copies can be ordered in quantities of ten at Concordia Seminary’s online store.